My first experience of playing a LucasArts adventure game came in 2016 when I played the remastered version of Day of the Tentacle. I have always enjoyed these types of games, as I had played Black Mirror and the King's Quest series when I was younger, and had a newfound appreciation for the genre once Telltale Games started releasing highly acclaimed adventure games. I was a fan of Tentacle's creativity, humour and art design. I appreciated its point-and-click formula. Its writing was top notch. To be perfectly honest, it made me feel nostalgic for a time I hadn't lived through myself. There was just something about that graphic style and gameplay formula that felt right to me. 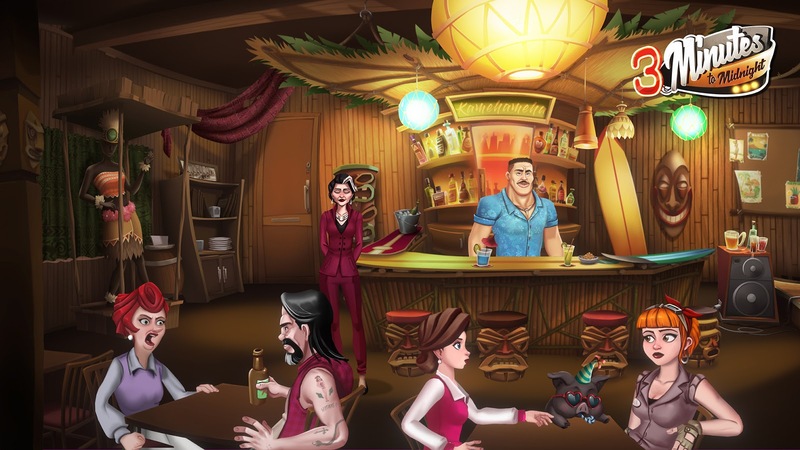 3 Minutes to Midnight is an upcoming adventure game that aims to capture that same experience. Betty, a teenager suddenly stricken with amnesia, finds her fate tied to a mysterious explosion in the New Mexico desert, a town full of strange people, and a doomsday plot counting down to the extinction of the human race. With a premise as promising as that, I felt the urge to sit down and play this while at EGX. During my play session, I was also joined by Jan Serra, the Game Director at Scarecrow Studio. "3 Minutes to Midnight originally began as a 3D game," he told me, "but we have a tiny budget and team so that wasn't possible. But we all love 2D point-and-click adventure games and we agreed the story I wrote would fit perfectly into that genre. So we built everything around that." The demo begins with Betty entering a rural campground and finding Pam, a young girl, chopping firewood by a fire. For a reason not yet explained, Betty needs a way of getting inside a nearby dam, and believes one of the occupants of the campground has the keys. As you would expect from a 2D point-and-click adventure game, clicking around on the level will have Betty walk to or interact with that area. One thing I ended up doing was clicking around just to find any secret opportunities for her to comment on. There was plenty to do in such a small space. Eventually I clocked on that Pam had the keys to the dam and she wasn't going to give them up easily. My first big challenge had arrived! I would later learn that I am terrible at some of the puzzles in this game, and that many of them have simple solutions that I couldn't think of. "Whenever I design a puzzle, it must have an appropriate hint," Serra said when discussing the process that goes behind making a puzzle in this game, "all the time you will have a hint of what you have to do. You will have feedback when something you do doesn't work. You may think it is logical, but if it doesn't work you will know why. It also needs to make sense. If you have a puzzle you need to go online to solve, you will be mad at yourself for not figuring it out yourself, and that's not a good experience for anyone." Once I got the keys from Pam, I made my way through the campsite to the edge of a lake. My path was obstructed by a swarm of angry mosquitoes that refused to let Betty past. I then spent the better part of ten minutes looking around for a solution before I was given a huge clue. I jokingly asked Serra if it was just me that was this bad at the game, and he told me that while the reception of this game at shows was positive, there were still many tweaks to be made. "This demo was also shown at E3 this year, and then later again at GamesCom and some smaller events in Spain. We are showing it now at EGX and the player reception seems to be positive. It really helps that we can see people play it. They seem to love the art and the humour, but we also found out certain design flaws. There are things that are really hard to spot or hear in the demo, that are being changed in the final game. But for those players that can solve the puzzles and have that look of satisfaction on their face, it's really fun to watch." I ended my play session after saving a man trapped inside an outhouse by increasing the pressure of the pipe, causing the whole thing to explode. I laughed a lot at the graphic and implied landing. My final question to Serra was what the most important lesson he had learned from developing 3 Minutes to Midnight: "I will say that your project should be ambitious, but not too much. We had to cut a lot of things from the original project, but once you reach a point where you say you can't cut anything else, that is when the game is perfect. We're indie so we really need to take care of our budget, make sure the project is at a size which you can handle." As mentioned earlier, 3 Minutes to Midnight will be an interesting game for those who are into point-and-click adventures, especially those who think the magic of those old LucasArts games has dwindled. The story seems tight, the humour is robust and the art is inspiring. 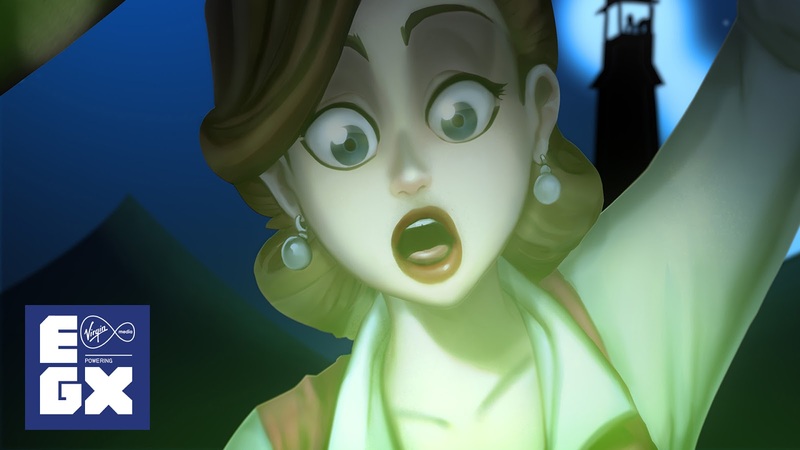 I, for one, absolutely cannot wait to learn more about what is going on with Betty and the townsfolk. 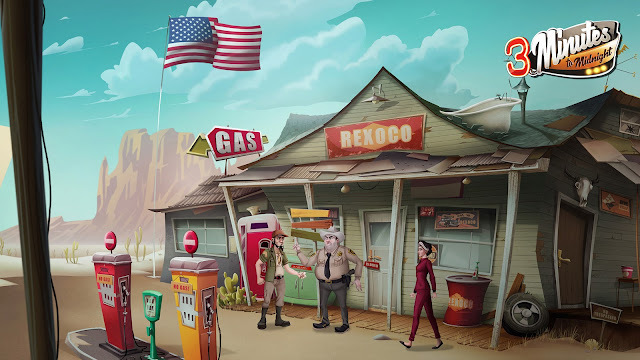 The game is currently targeting a 2019 release date on PC, mobile, PlayStation 4, Xbox One and Switch.